Coffee Pot Stamping Cafe: Crafty Calendar July 1st Challenge - Theme "Anything Goes"
Crafty Calendar July 1st Challenge - Theme "Anything Goes"
For our July "Anything Goes" challenge at the Crafty Calendar Challenge, we have two great sponsors; Stamping Studio and Bugaboo Digital Stamps. 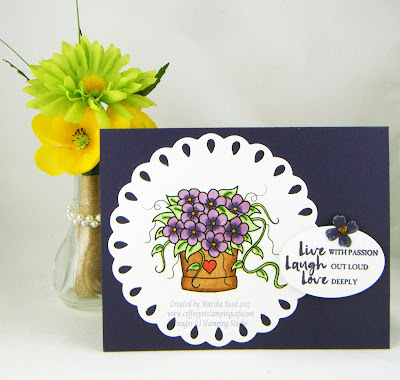 We're starting off the month on July 1st with digital stamps images from Miss Daisy Stamps at the Stamping Studio. One thing you may not know about me is that I love flowers. Any and all flowers, even some on plants that might be considered weeds. I think they are just one of the most beautiful creations. As you can see, I picked this great digital image of a pot of flowers. I'm calling them violets, as they are one of my favorite flowers. This image is from Miss Daisy Stamps. I love the flowers, and those vines trailing out of the foliage. For me, flowers brighten up even the darkest days. Our first sponsor for the month of July is Stamping Studio.